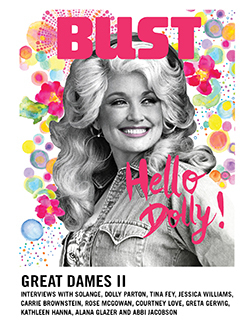 BUST’s current cover girl Tavi Gevinson really has come into her own. The sixteen year old has gone from an adolescent fashion blogger to a mature pop culture curator (she started ROOKIE online magazine, soon to be a book this fall) in no time flat. Tavi hit the last stop on the Rookie Road Trip this Sunday, bringing her personal brand of magic to the City of Angeles. To celebrate the end of the Tavi Train, the teenage blogger held the Strange Magic art show at LA’s Space 15 Twenty along with her friend and visual artist Petra Collins. The show was inspired by a teen girl’s bedroom- something Tavi definitely knows a lot about. It featured a queen-sized bed, desks, some old records, glitter and even a very graffitied tree house. Sounds like mucho fun. One attendee described the show as the cleaned out closet of a 16-year-old Courtney Love, according to the Urban Outfitter’s blog. With tons of eccentric memorabilia, merchandise, photos and knick-knacks, the show was a must-see for anyone in the LA area, including her celebrity supporters. Tavi had her share of famous fans since Style Rookie set the blogosphere on fire. Agyness Deyn, Miranda July and Jonny Makeup were all in attendance at Strange Magic. If you missed the opening party, worry not! Our August/September cover girl has lots more fun in store.